It’s almost the Fourth of July and it’s summertime, and you know what’s on my mind? Burgers, fresh and hot from the BBQ! However, I know that many of my health-conscious readers might avoid them like the plague, thinking that burgers are one of the unhealthier meal options out there. But I’m here to tell you that, if you’re watching what you eat, it’s not really the burger you have to worry about. And I’ve got some BBQ tips that will get you on the right path. In fact, you can eat burgers in moderation, provided you generally follow a well-rounded diet (and go for the leaner meats whenever possible). Instead, it’s the buns, sauces, and side dishes that can really lead to inflammation, skyrocketing blood sugar, and all kinds of empty, added calories. To help you avoid these enemies of a healthy body, here are a few tasty, healthy ideas that can help you wrap and dress your burger in a way that sets your mind at ease and keeps your health goals on track on the Fourth of July holiday and throughout the whole summer. Yes indeed. This is one of the best ideas I think I’ve ever seen. To add a lot of vitamin A and other valuable nutrients to your burger, think about grilling up some sweet potato to cushion your burger. Simply find yourself a big, fat sweet potato and cut a few rounds/slices from it—the biggest will work the best for average-sized burgers—and then heat up some olive oil in the pan and fry them for about three to four minutes per side. You can also grill them (it’s even healthier this way!). Season the cooked sweet potato slices with a little bit of salt, pepper, and dill, and then place one slice on either side of your burger and enjoy. I’m sure you’ve seen portobello burgers, but have you ever thought of using portobello mushrooms as a bun? They only have about 19 calories each and feature high levels of copper, which is required to metabolize iron and selenium, an important antioxidant. All you have to do is get a couple of portobellos, cut off the stem, wash them, brush some oil on the pan or grill, and cook them for two to three minutes per side. Use one portobello “bun” on either side of your burger, or place your burger on a single portobello cap for an open-faced sandwich. Eggplant might not be a powerhouse of any one nutrient, but it features a variety of the stuff required for a healthy diet. Eggplant is a great source of fiber (3 g per 100 g serving), potassium (229 mg per 100 g serving), and folate (22 mcg per 100 g serving). And with a 100 g serving coming in at only 25 calories, it is a much better—and tastier—alternative to traditional burger buns. 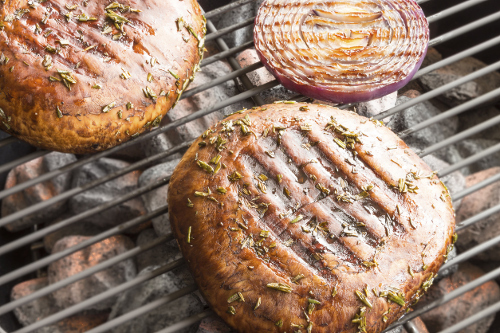 Simply heat up your grill, brush the washed, sliced eggplant with olive oil, salt and pepper, and cook each side for four to five minutes until you see grill marks. Sandwich your burger between two eggplant slices and you’re good to go! By choosing any of these options, you’re saving calories and adding nutrition to your burger—and dare I say, having a healthy Independence Day meal? If none of these options suit your tastes, you can try whole-grain buns or whole-grain pita pockets to boost your fiber intake and avoid the high carbs in the white flour versions. For toppings, stick to fresh veggies like onions, tomatoes, pico de gallo, and grilled peppers. Avocado is another healthy topping that would be particularly nice with the portobello bun. If you need sauce or dressing, get sugar-free versions. Mustard is usually a healthier way than ketchup or barbecue sauce to add some pizzazz to your burger. When it comes to side dishes, steer clear of the heavy mayo-based potato salads and slaws. Instead, look for (or prepare) oil-and-vinegar-based slaws, potato salads, or beet salads, leafy greens with light vinaigrette, grilled vegetables, or raw veggies with humus. Happy Fourth of July! Enjoy your healthy BBQ.